The lure of two bibulous delights took me to Southwark in south-east London a few days back. First was the lure of a bottle of the new cask strength release of Redbreast 12 year old from incomparable spirits outlet The Whisky Exchange in the Vinopolis complex near London Bridge railway station. Not one I could afford to miss being a lover of pot still Irish whiskey and this being my first opportunity to acquire an unadulterated specimen. 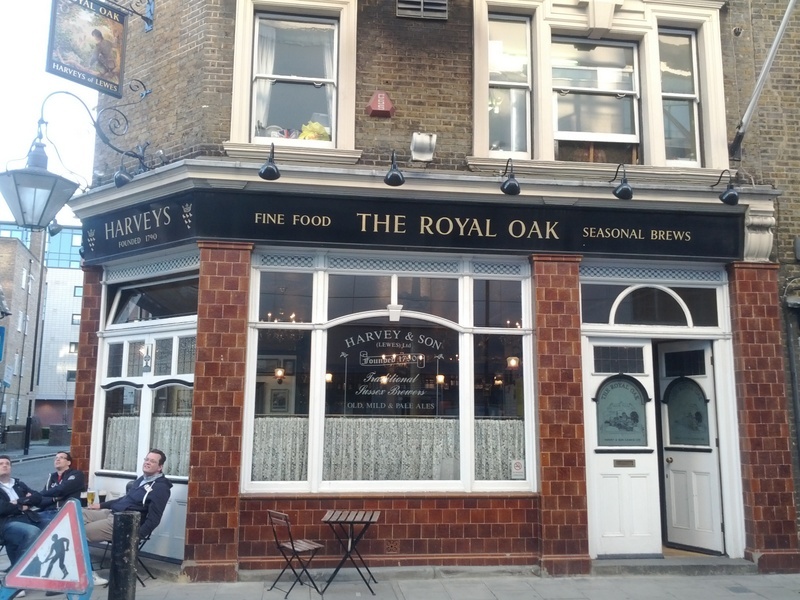 Second, while I was in the area, was the opportunity of a couple of pints of Harveys Brewery’s exceptional, seasonal 1859 Porter in the multiple award-winning pub the The Royal Oak in Tabard Street, not far from the Northern Line tube station in the heart of The Borough itself. Only available in Lewes-based brewer Harveys’ tied estate during March and a little into April, draught 1859 Porter (4.8%) is a tremendous cask-conditioned example of the revived black beer style, simultaneously both dry and a little sweet, hoppy but mellow, chewy, liquoricy, tarry and roasty with a loose dark brown head. 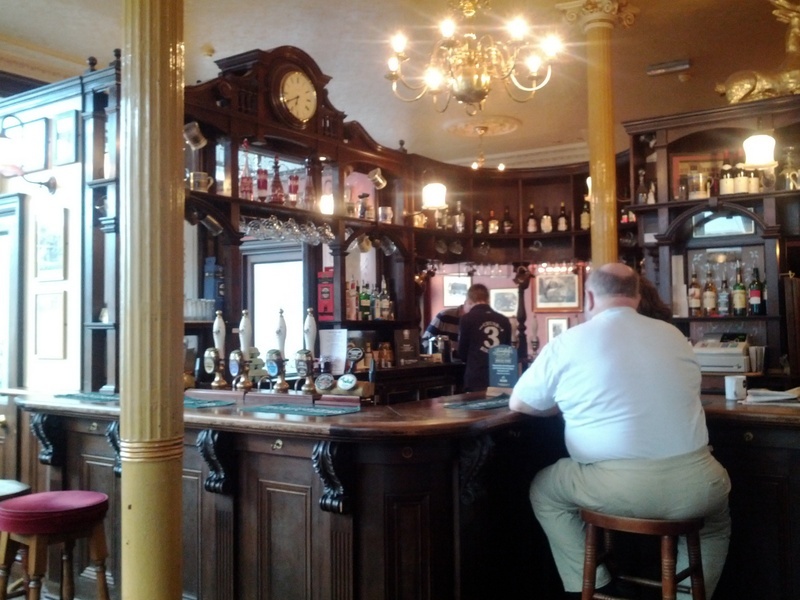 Not like many other beers going by the description of porter nowadays, it takes one’s taste buds back to earlier times, aided by The Royal Oak’s decidedly (and delightfully) Victorian surroundings. 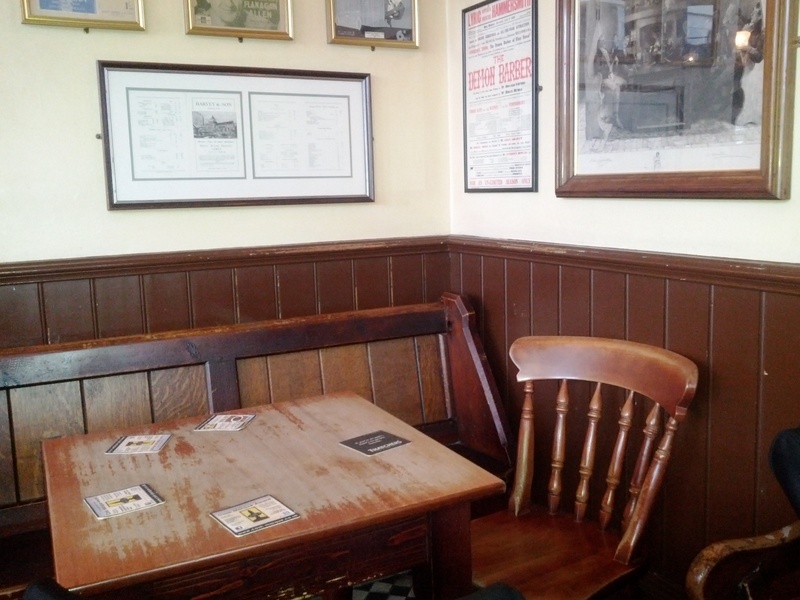 For those not so taken by the 1859 Porter, Harveys’ northernmost pub (it’s just south of the Thames) offers a good cross section of the Sussex brewer’s art. This includes its draught Sussex Best Bitter (4.0%, one of my absolute favourite “standard” bitters) and Mild (3.0%), as well as its 4.3% cousin Sussex Old Ale in winter (and still on tap during my visit), as well as a wide-range of well-priced, hearty food. But Harveys’ beery retinue also includes species not often seen nowadays some of which can be found in The Royal Oak. These include traditional half-pint bottles of Bloomsbury Brown ale (3.0%, formerly known as Nut Brown) and Sweet Sussex stout (2.8%) – all British brewers seemingly once had similar brews – as well as Harveys’ bottled Imperial Extra Double Stout (9.0%) and the year-round bottled version of 1859 Porter. There are even real oddities such as the 1.0% Bill Brewer and John Hop, based on Harvey’s old and pale ales respectively. Not great beers from memory (it’s years since I’ve tried them) but better options for drivers than concoctions such as Clausthaler and Kaliber. The fact that these bottled products exist at all is a testament to the history and commitment to tradition of the brewery. Its draught ales remain benchmarks few others can aspire to match. Even if the drinker is not literally back in time when imbibing a jar or two of Harveys, there’s a discernible flavour of tradition in the products of the East Sussex brewer, whose history dates to 1790. Indeed, while I greatly appreciate the products of the latest “craft beer” brewers and the wave of smaller British concerns inspired by CAMRA from the 1970s onwards, there’s often something about the beers of the UK’s long-standing family-owned and regional brewers that I find marks them out for special attention, even if they’re not always the most challenging or inventive. My sense is that it’s the unique yeast strains endemic to these brewers – yeasts that have developed an almost symbiotic relationship to the beers and their brewery over many years – that really single out the beers of brewers such as Harveys, Caledonian, Adnams, Holts, Fullers (even the oft-maligned Greene King) over those of their upstart rivals. Certainly, I can often identify the brewer when presented blind with beers from these breweries, something I can rarely claim to do with latter-day micros. Maybe it’s also something of a quiet rebellion in myself against the mass market driving, on the one hand, towards ever paler, more fragrant, golden ales and, on the other, towards extremely bitter, often extremely strong IPAs and imperial stouts. Flavour is often a victim in the first instance, the ability to inspire a successful pub session the victim in the second. Whatever, it’s definitely true that I’m currently finding “old school”, late 20th Century-styled British beers of the kinds I grew up with to be my preferred tipples, when available. With luck, I’ll have the chance to pop back to the Royal Oak before the porter disappears for another year. But that won’t be the only time I drop in during 2012.